By virtue of our Baptism, we are all called by God for some work in the world to continue Jesus’ mission to build God’s kingdom. Some of us are also called to minister within the Church itself to help the rest of the community to worship God and to support them in their work in the world. To hear God’s call to this kind of vocation is not always easy and we are here to help you discern your call as best we can. 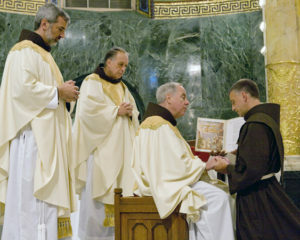 If you would like to talk to someone about a vocation to the priesthood, religious life, or even as a lay ecclesial minister, please contact our Center for Franciscan Spirituality at 212-736-8500. If you would like information about exploring a vocation as a friar of Holy Name Province please click here.